Last week, I was in Las Vegas during the horrible massacre that took place. My local delegation and other APWU leaders volunteered at a local Las Vegas Blood Center and were deeply touched by what we witnessed. Together, we wanted to do more. So, the Southwest Florida Area Local membership with the help of Laura Bethel of Matteo Graphics decided to design t-shirts to benefit those affected in the Las Vegas shooting. For a donation of $10 or more ($13 or more for 2XL or larger sizes), you will receive one of these t-shirts. All monies raised above the cost for the shirts will be sent back to Las Vegas to help those affected by this tragedy. These shirts are American Made and will be sent as early as next week. *Please note the size you need and the address to send to. 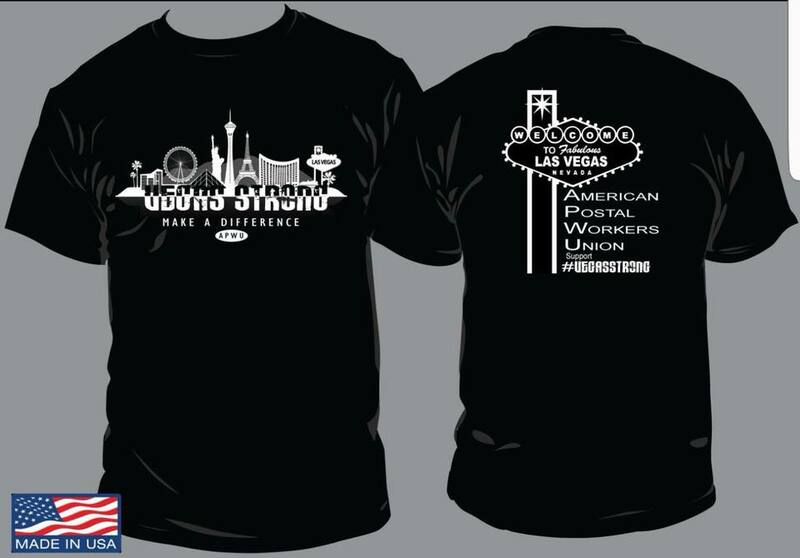 This entry was posted in General Union Business and tagged #VegasStrong, APWU T-shirts, donations, horrible tragedy, Las Vegas, Make A Difference!, mass shooting, Southwest Florida Area Local. Bookmark the permalink. I received the tee shirt today and it is very nice, beautifully designed and well made. Will be ordering more. Thank you for giving us a way to help those who are recovering. The news is reporting that many of the people are needing surgeries and have no health insurance. SWFAL-APWU splendid. Thank You very much and “Everybody can do Something.” Good Help is needed and should be endless! You’ve shown the true spirit of solidarity and how we can reach out to working people and all others in need. You’re an awesome local!